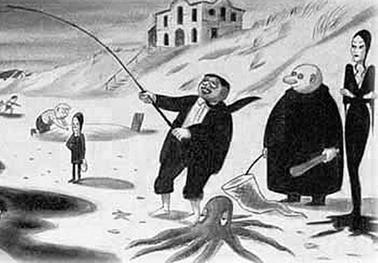 The Addams Family is a group of fictional characters created by American cartoonist Charles Addams. The Addams Family characters have traditionally included Gomez, Morticia, Uncle Fester, Lurch, Grandmama, Wednesday, Pugsley and Thing. The Addamses are a satirical inversion of the ideal American family: an eccentric wealthy clan who delight in the macabre and are seemingly unaware that other people find them bizarre or frightening. They originally appeared as an unrelated group of 150 single-panel cartoons, about half of which were originally published in The New Yorker between their debut in 1938, and Addams's death in 1988. They have since been adapted to other media, including television series (both live and animated), films, video games and a musical. The Addams Family has been evicted! The family's evil attorney kicked them out of the house, planning to take their riches. The whole family, except Gomez, arrives at the house to try to reason with the attorney, but when Gomez arrives, his family is missing. In this platform game for the Nintendo Game Boy system, it is up to you, as Gomez, to find your family and save the house and the riches. You must travel everywhere through the house, the woods and beyond while you jump over monsters and animals or shoot them with your bow and arrow. If they hit you, you loose health. You get five hearts of health, and five lives to start.